I am in the final stage of unpacking where you start to hang things on the walls. You've gotten to know the place and are ready to commit to the permanency of the nail going in the wall. The first one up was this painting...it isn't a "good" one technically. When I started it 10 years ago I didn't intend for the table to be animated, that happen along the way. 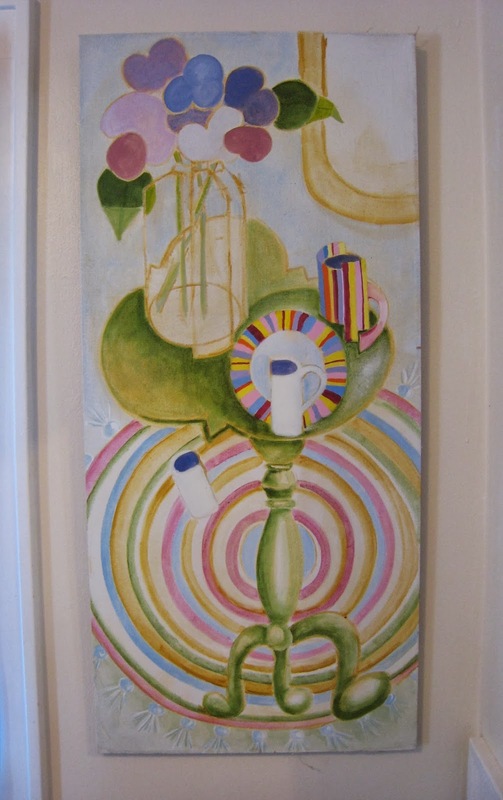 I did try to paint the vase from every angle ( and attempt to understand cubism), but not sure I was successful. Obviously it is not for the skill of the painter that I hang the painting, but for the love of the story it tells. It simply makes me smile. Yeaah , I've started to put together my crochet granny square blanket! 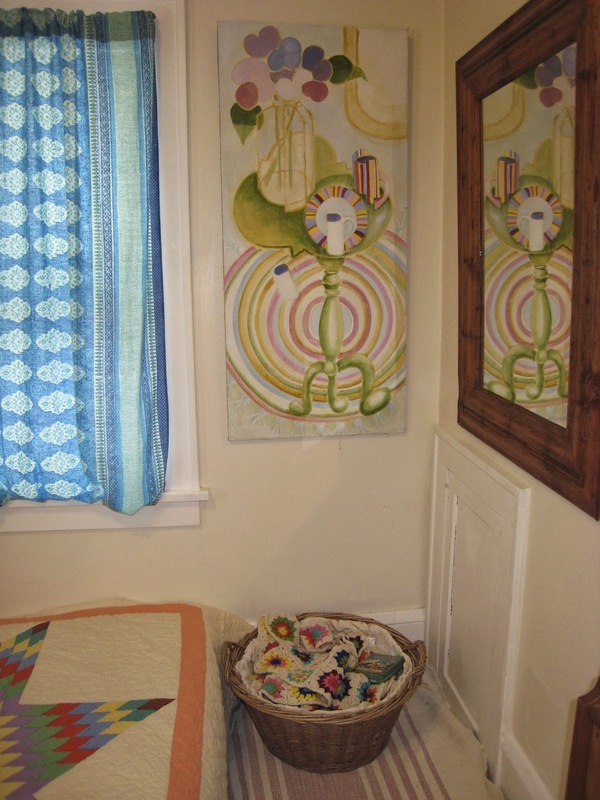 The pink and cream rug under the basket was woven by my Mom. And the mirror in the picture at the top was made by Homayoon. The quilt is my latest vintage find. I found it at an estate sale. The woman said her mother made the quilt top but before she quilted it the top got stained. Then her church group said they could fix it....remove the damaged part and put it back together again and quilt it, if she would put it in a fundraiser. Not sure why it was still in her possession. Did it ever make it to the fundraiser or did she buy it back. It had never been used in perfect condition...I'm guessing it was meant for me! While out antiquing we found a trunk of muslin pieces...a dress makers trunk perhaps? I couldn't resist the soft thin muslin. I had been thinking about rust printing on fabric so it must have been written in the stars for me to find that trunk. I love the results! 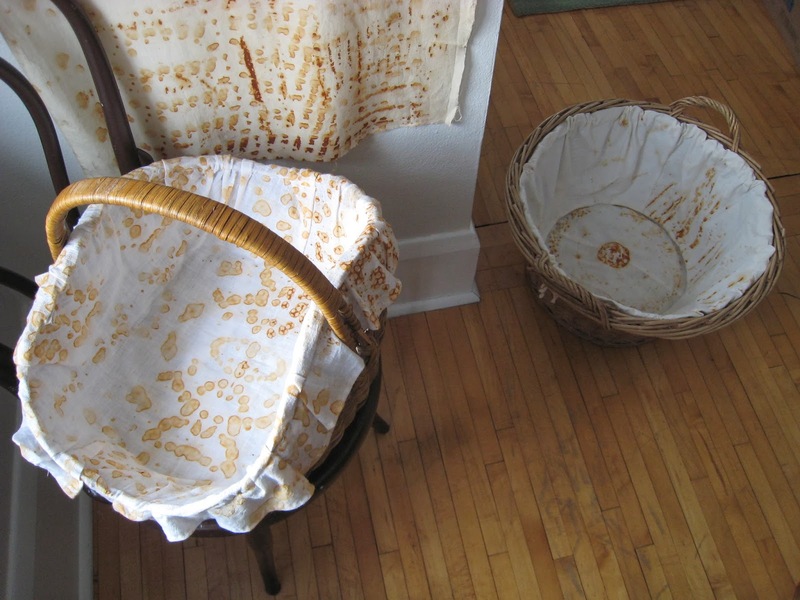 I had a couple of baskets worn from use that needed linings, a perfectly practical way to use the printed fabric. I think I will add in some stitching to the long piece hanging on the wall...maybe some colorful threads to bring it to life! We will see. Endless possibilities for printing...if only there were more time. 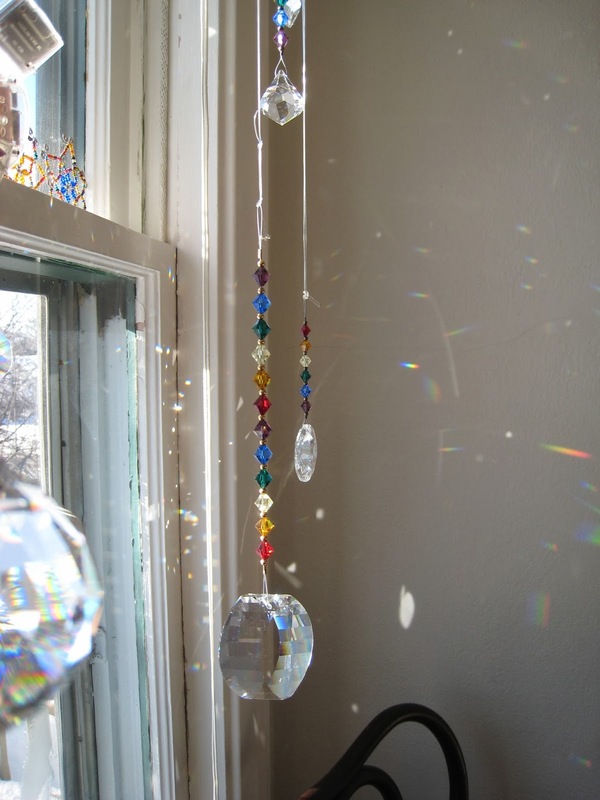 We unpacked Homayoon's crystals and hung them in the dinning room. The sun hits the room early morning till around 4 in the afternoon. Rainbows dance on the walls, ceiling and floors. It makes me very happy to watch them. 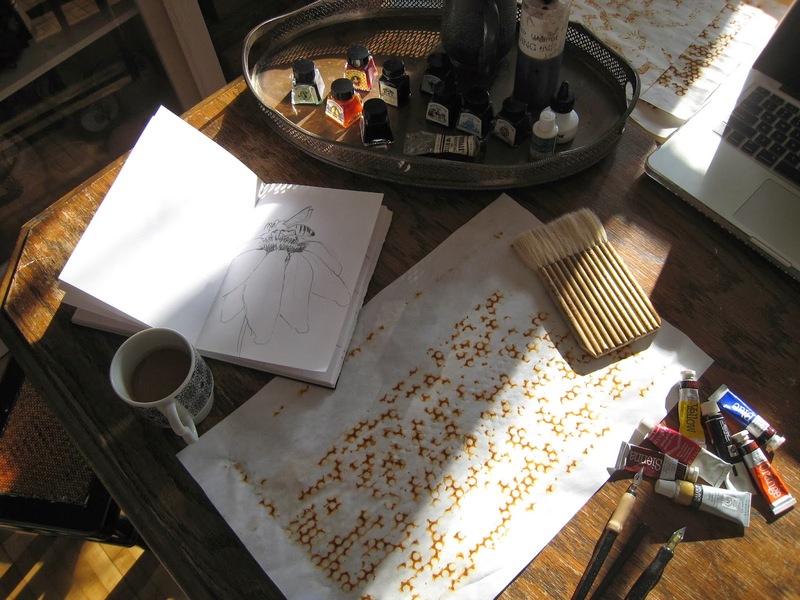 Since it is -10 degrees today and suppose to be colder tomorrow, working in the attic studio is out of the question. So I brought down some supplies and started working on a commission. Something with bees. Sunshine, rainbows, paint, ink and bees...a good day, never mind the cold.